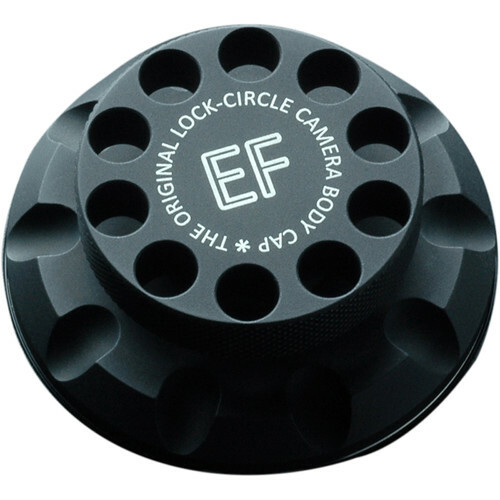 Secure and stylish, this durable Body Cap from LockCircle is for Canon EF-mount cameras. This high-precision cap features a locking design that works in conjunction with the camera's bayonet lens release button to prevent accidental removal. When you're ready to remove it, though, knurled edges and a finger-fit design offer extra grip to suit working in any climate. The cap is machined from solid billet aluminum, has a black anodized finish, and a smooth sanded texture. Box Dimensions (LxWxH) 4.2 x 3.7 x 2.6"
Camera Body Cap for Canon EF (Black) is rated 4.7 out of 5 by 3. Rated 5 out of 5 by Coltondaniel from Must buy for those worried about body caps falling off. Awesome! No more fear of body cap coming off during travel or rough adventures. It can handle any environment I throw at it. Build quality is superb! Rated 4 out of 5 by Peter from Well Made This is a very well made product but it is a bit expensive. Although, it certainly isn't as easy to lose than the normal plastic caps. Rated 5 out of 5 by Fred L. from Big, heavy, and unnecessary I got this for a 1V I'm not using much anymore. I love it!